I love when you can mix together a dinner in split second – and yet to be 100% homemade – this Tomato Soup nails it! This soup is for all my freezing friends at the east coast – because there is nothing better after being out in the snow, than a nice warm soup with pesto and bread to warm you up – it’s pure homemade happiness! – and who doesn’t like some nice colors at this time of the year?!? Peel the Carrots, Ginger and Onion and cut in smaller pieces. You don’t have to cut the Tomatoes, just put them in as they are – nice and easy! Place all vegetables in a saucepan and pour over the Vegetable stock (it will not cover completely). Boil for half an hour – or until Carrots will slide of a meat-needle when you stick it in and lift it up. Then add Chipotle, Whipping cream and salt and blend thoroughly with a hand blender. 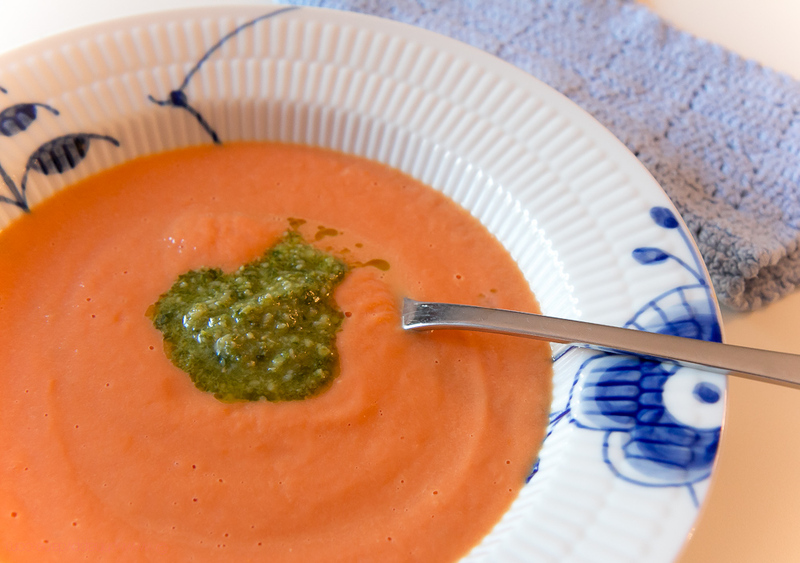 Serve the soup with pesto and a good piece of homebaked bread. – You can also, when serving, add cooked pasta (elbows) or Goldfish (the snack crackers) – my kids loves that! « Jell-O as a treat for lunch or as a snack?